To perform action 2 players must simultaneously press 2 different buttons ( trigger_use). How to do that? I think the only way to do it is with a script. 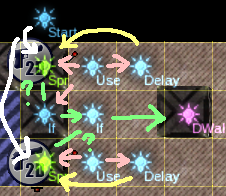 You'll need to change map.b1name, map.b2name, and map.trigger to the entity names of the buttons and what should be triggered. -- is it the first button pressed? Thanks for the answers. I will consider both options in the near future.